The United States Olympics Committee is one of the most litigious organizations in the world, rivaling even Disney for sheer "don't mess with our copyright" attitude. Therefore, when I heard that Ravelry had received a "Cease and Desist" letter regarding the Ravelympics, my first reaction was "I'm surprised it took so long." 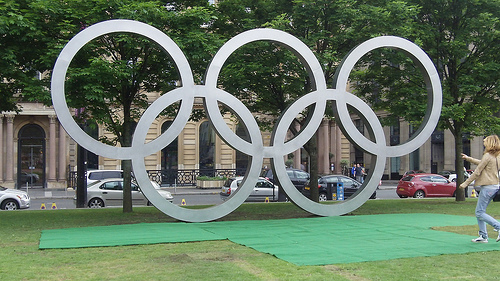 Anything that even suggests five rings will receive a smack-down from the Olympics. And using half the name to make the word "Ravelympics" is like waving a cape before a bull. "We believe using the name "Ravelympics" for a competition that involves an afghan marathon, scarf hockey and sweater triathlon, among others, tends to denigrate the true nature of the Olympic Games. In a sense, it is disrespectful to our country's finest athletes and fails to recognize or appreciate their hard work." Seriously, people: disparage knitters at your own risk. There are 50 million knitters in North America, and two million of those are on Ravelry, the social networking and project support site for knitters. Knitters come from every walk of life; young and old; male, female, and all points in between on the gender spectrum. Why would you be casually rude to such a huge segment of the population? Talk about denigration. Why did this USOC clerk feel it was necessary to insult the entire effort? If you want to claim copyright violation, then claim copyright violation and step back. In a sense, it is NOT disrespectful to our country's finest athletes to use their efforts as an example of what you can achieve when you push yourself harder, strive for a higher goal, and join together in a spirit of friendly competition. What could be less denigrating? The USOC quickly backpedaled with an apology on their website. But weirdly, the apology seemed to suggest that knitters would want to send their knit items to the USOC. "we would welcome any handmade items that you would like to create to travel with, and motivate, our team at the 2012 Games." That's a little weird, right? A bit off-key, if you ask me, and it rubbed a lot of knitters the wrong way, too. Thanks but no thanks, USOC. But hopefully this bizarre and somewhat tone-deaf apology will serve as an example for any other public-facing organization that might be thinking about insulting knitters or knitting in the future!